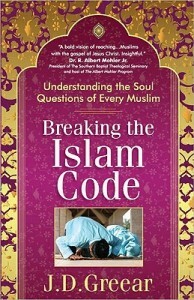 In his book Breaking the Islam Code, J.D. Greear helpfully points out that the core beliefs of Islam can be accurately summarized into five points of doctrine: monotheism, prophets/apostles, angels and demons [actually, "jinns" is a more accurate term than "demons"], holy writings, and final judgment. "Monotheism" must be understood in three ways: God alone is Creator and Lord, God alone is worthy of worship, and God alone possesses divine attributes (the “omnis,” etc.). As far as I can tell "prophet" (nabi) and "apostle" (rasul) are used interchangeably in Islam. (Muslims refer to Muhammad as both "Prophet" and "Apostle.") Some Muslim accounts claim that there have been over 124,000 prophets and apostles. However, Islam teaches that there are 25 primary prophets; Adam is considered the first Muslim prophet, Jesus in considered the 24th, and Muhammad is considered the 25th and final prophet (notice that the disciples of Jesus are not mentioned). In Islamic belief, the primary teaching of the prophets was all the same: that there is only one God and that people should repent and seek God, but each prophet also added something new to the body of revelation. "Angels" in Islamic belief are spiritual messengers and servants of God, prophets, and jinns: they do not have free will. Iblis (also called Shaytan) was a jinn who refused to pay respect to Adam, and thus became an evil enemy of Man. Other jinns also fell (though there is an idea of some jinns remaining good, the word is usually used as a near synonym for “demon”), they can change form and they attempt to deceive people (notice the idea of deceptive spirits). Muslims believe that before the revelation of the Qur'an, God gave the Taurat (Torah), Zabur (writings of David, i.e., the psalms), and the Injil (Gospel: many Muslims claim that our Gospel accounts are corruptions of an original Gospel in which Jesus was a Muslim, but- one must ask- is this claim consistent with what the Qur'an says?) Muslims believe that the Qur'an is the ultimate holy book in its eternality, its finality, and its authority. Muslims believe that the Qur'an, though revealed to Muhammad in time, exists eternally in Heaven. The Qur'an in Arabic is thought to be a word-for-word copy of the eternal Qur'an; translations of the Qur'an may reflect the meaning of the Qur'an (more or less), but they lack the power and validity of the Qur'an in Arabic. The other holy writings are thought to reflections of God’s will and character, but they are considered to be more closely related to particular times and places. Muslims believe that the Qur'an is the last holy book that will be revealed. Muslims generally believe that the Qur'an is the only sufficient authority in all matters whatsoever, including spirituality as well as laws for the state. Islam teaches that there will come a day in which all of humanity will be judged on the basis of faith and works. In one hadith, Muhammad says that if a person repeats the Muslim confession in Arabic (with belief that the confession is true), and has one atom’s worth of good works, he will go to Heaven. Many Muslims believe that everyone will spend some amount of time in Hell in order to burn away sins. There is no assurance in Islam (except, perhaps, for martyrs) that one will not suffer in Hell (at least for a time). Notice two things about the above teachings. First, notice their simplicity. Understanding the basics of the Muslim faith is much simpler than wrapping your head around Grudem's Systematic Theology (for example). The apparent simplicity of Islam is one reason that the Muslim faith has gained increasing popularity world-wide. Second, notice the apparent similarity between Muslim teachings and the Christian faith. At least on a superficial level, both Muslims and Christians believe in monotheism, prophets and apostles, angels and demons, holy writings, and the final judgment. These apparent similarities are the reason why I've even heard some of my Muslim friends claim that both Islam and Christianity teach basically the same things. In some of my subsequent posts to this blog, I hope to examine crucial differences between Islam and Christianity.